No matter what Las Vegas says, no matter what polls say, the Caps being Stanley Cup favorites at any point during the regular season, or even early in the playoffs, is mere distraction. As we’ve seen several times in the past, including last season, being the Stanley Cup favorite hasn’t worked out. That’s not to say we shouldn’t root for them not to be Stanley Cup favorites, or that not being a Stanley Cup favorite has worked out, it’s just that we shouldn’t care at all, or even acknowledge any article or survey that states it. No matter how good the Caps have been in the regular season, their playoff records have been underwhelming. Yet, a couple of current players are all-time franchise leaders despite having never advanced past the second round. Braden Holtby is the Caps’ all-time leading goaltender playoff wins, with 22 (and… loses, with 24). What’s more painful is that Holtby’s GAA in the playoffs is 1.87, which leads the NHL since 2011-12. Alex Ovechkin is the team’s all-time leader in playoff goals, points, and game-winners… which is quite an accomplishment considering all of those early exits. While any individual record loses some relevance when the team loses, the Caps’ routinely making the playoffs and grinding through long series only inflates the ‘all-time’ records. Just imagine Ovechkin and Holtby’s team records if the team won more. It’s not closing anytime soon. He’s 31. He’s the Russian Machine. He’ll play till he’s like 45, like that Jagr guy. That gives him 14 more years to win a championship. Okay, perhaps this is wishful thinking, but so long as he’s leading the NHL in goals and surrounded by players like Nicklas Backstrom, Evgeny Kuznetsov, and Holtby – great players who are younger than him – the window is open. I read and respect articles about advanced statistics. They make it clear what’s working and not working, which players are stepping up and which aren’t… despite the game’s outcome (though fancy-staters need to read what the team thinks of them). Of course, the more things that are working, the more likely the team will win, especially over the course of a season. Come playoff time, with the limited number of games and far higher stakes, it’s not unusual for teams to put up solid advanced stats in loses. How many times have we seen a 2-1 defeat where the Caps out-Corsi and out-Fenwick the opponent? How many games have been decided by the virtual coin-flip of overtime? Being the ‘better’ team in a loss, or a series loss, is simply infuriating to hear about, even if it’s statistically correct. Of course every team should be striving to be the best, at all points of the season. Win the division, win the conference, win the President’s Trophy. The Caps have done that multiple times. That said, the more it happens, sans championship, the less interesting it becomes. While it used to be fun, it’s now cringeworthy to see the latest banner unfurled, proclaiming the Caps the regular season winners of the <division and/or conference> for the <year>. They’re running out of room for those and they’re becoming a hazard for the Verizon Center birds. 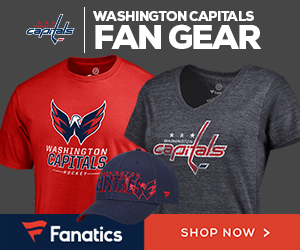 If, at any point this season, anyone says “These aren’t your father’s Capitals,” you should be barred from watching, talking about, reading about, or even thinking about the Caps for the remainder of the season.